Oh what a lot of lovely things! Is Lauren a new friend as a result or have you known her all along? You were a new friend as a result of a mug exchange once upon a time. I think Stephanie has a knitting ministry...she is bringing bloggers together. I love these little exchanges that you all do. It's so sweet and the stuff you get is great. I concur that putting together a package is just as fun as receiving one! I don't know how Stephanie does it but she always does a stellar job of pairing participants up. 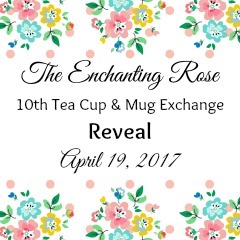 It won't surprise you that my favourite parts of your package is the pretty teacup and the stickers (the lily of the valley will be popping up in my garden soon). I'm also intrigued by the eggnog tea. What lovely gifts you received! This exchange has truly been one of the highlights of my spring and fall! Blessings to you this week! Awe, what lovelies you received along with your teacup. I'll be posting mine on Wed. I so enjoyed the exchange and will definitely do it again in the fall. I made two new great friends! 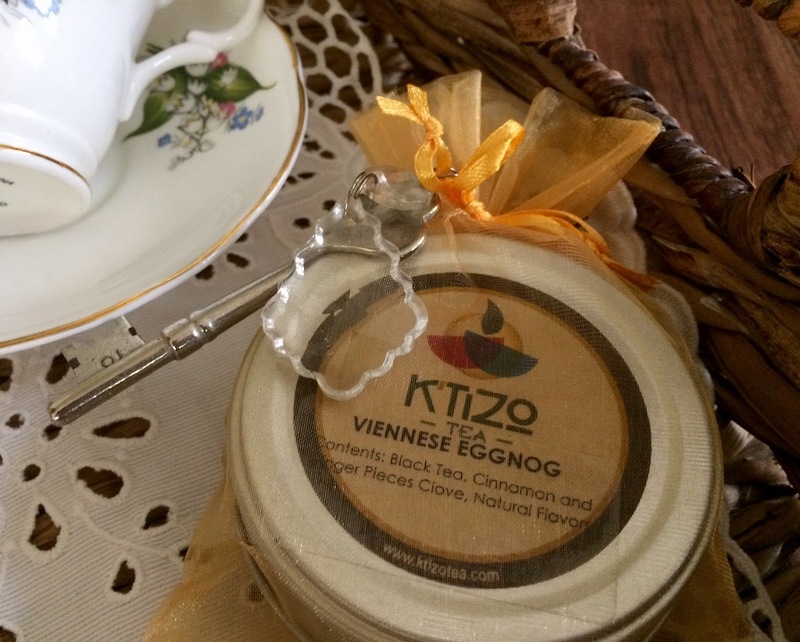 What a lovely package you received kitty, the cup is lovely. It is always fun to put a special gift together too. What a wonderful and fun exchange. What fun the tea cup exchange is. I love your new dainty tea cup and all your goodies. Glad you received a blessing putting your package in the mail to exchange too. 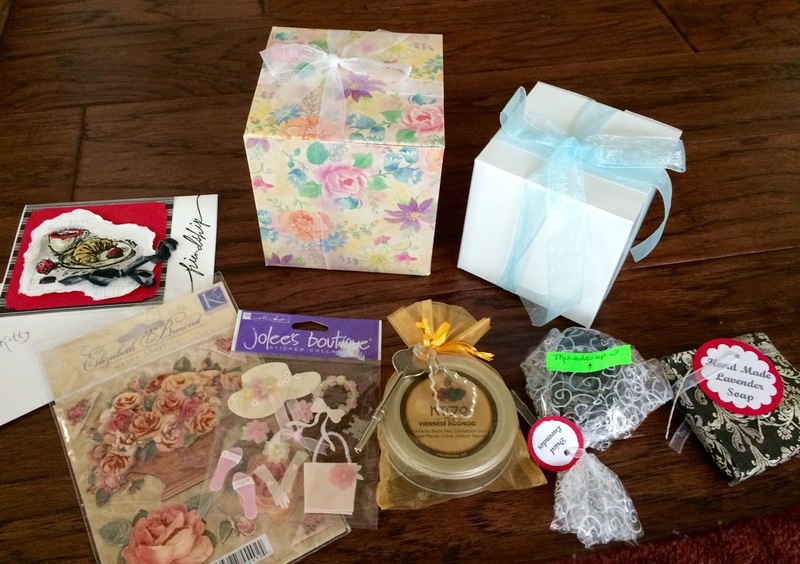 What blessings these teacup swaps are = Stephanie is so devoted and makes it so wonderful for us to make new friends! Your surprises are wonderful, Kitty - I have never seen that teacup before - it's beautiful! It will always remind me of her. I have a few finishing touches on my post for the reveal. You just inspired me to get it done. I am soooo excited about it! What a great gift goodie assortment you received Kitty! Stephanie really put together some nice things. I love her crafted lavender soap, and that tatted edge on that hankie - ♥! What a beautiful assortment of gifts...both given & received! I adore your new teacup....so pretty! Hard to believe that the exchange has been going on for 10 years...wow! Such pretty gifts. Seems like a wonderful and fun exchange. I love the lily of the valley teacup! Have a wonderful week, Kitty. I'm so glad you're enjoying it all! I am already in the hunt for things for the NEXT exchange lol! Simply lovely, my friend! The tea cup from dear Lauren is absolutely beautiful and so perfect for Spring :) The little extras she put in are wonderful and I know will be enjoyed by you. I can't wait to see what you sent to Lea as I can speak from experience that you always send an amazing package of tea loveliness. Thank you for joining the fun, sweet friend. I thoroughly enjoyed seeing what sweet Lauren sent to you. All of you ladies have such generous hearts. Love to you! Hi Kitty, what a lovely package of goodies you received in our 10th exchange!! Love the beautiful tea cup and all the pretties you received from Lauren. Everything is so thoughtfully included. I know your gift sent to Lea will be beautiful too and I look forward to visiting her tomorrow. I just recently met Lea and she is a sweetheart. It's so much fun to make 2 new friends each exchange. Enjoy the fun and have a beautiful day. 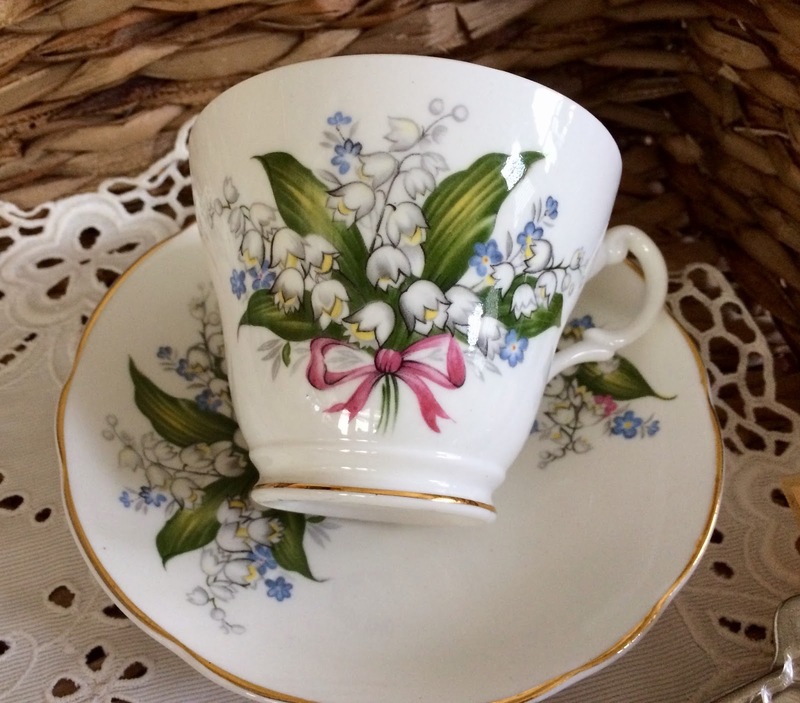 I LOVE that tea cup with the lily of the valley, wow that's gorgeous! I'm a lace girl all the way and that hankie is lovely. Lauren certainly showered you with some delightful gifts, what a sweetie. So many lovely items here! This is my first exchange and I loved being a part of it. Stephanie is such a sweet heart :-) Have a wonderful day! 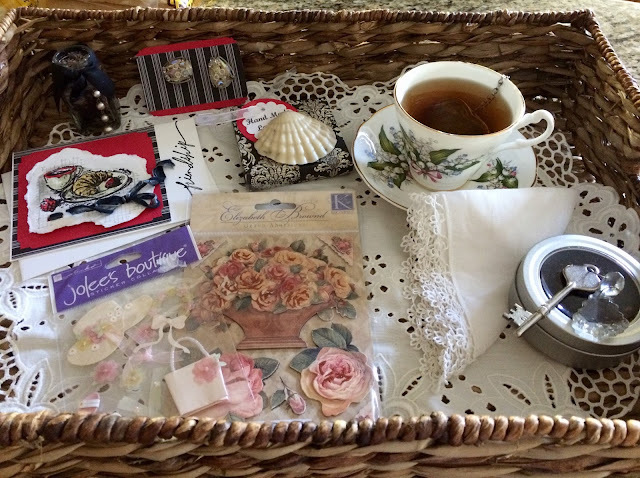 A great idea to lay the treasures from your parcel out in a tray, and my you were blessed with a pretty lily-of-the-valley teacup and other wonderful things. What a lovely gift! And I adored all the goodies you put together for Lea. Enjoy your week, Kitty! What a beautiful gift you received from Lauren! This has been quite a bit of fun to see and share in the tea cup exchange. This is just so much fun, getting to see everyone's exchanges! Love your cup as well, and all your other goodies. Blessings to you Kitty! You received some lovely items. It is fun to join this event and to meet new friends. What great items. I just looked long a hard for some of those "fake keys" to go with my Secret Garden clip board I made....I finally found some at an antique mall. Looks like you received some fun things. Thanks for sharing and linking. I forgot to say I have sold that Royal Stuart cup and saucer before so I remember it is really lovely!!!! The English is so much better than "China"! Oh, how PRETTY!!! It is all just so beautiful...so thankful you enjoyed the exchange. It is such a sweet blessing for us all, isn't it? God bless Stephanie for all she does for us...and God bless you, too!! What a wonderful package you received Kitty. I adore the teacup you received. May you enjoy a beautiful spring and a wonderful week! Lovely gifts, Kitty. What fun to exchange these gifts and make new friends. That was a perfect gift for you Kitty. I just love your new teacup and you must have had so much fun opening all the goodies! 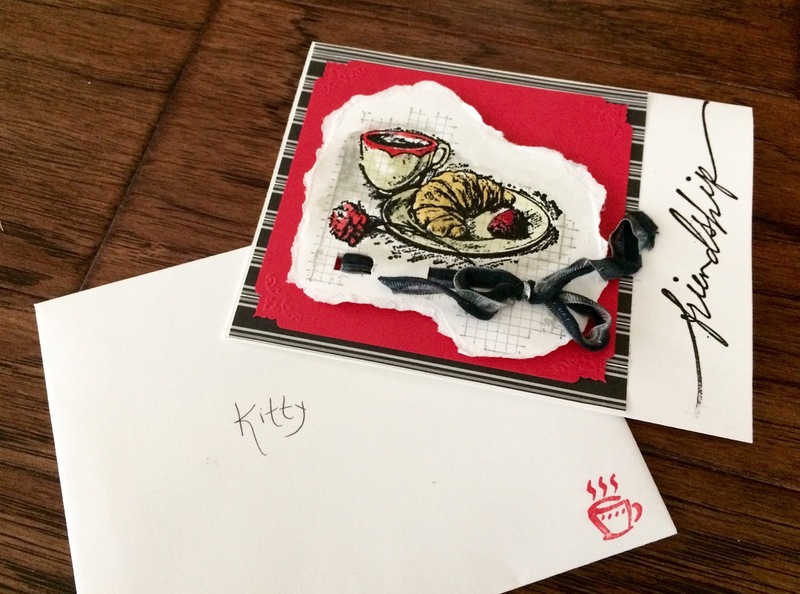 Hi Kitty, wow you received such wonderful goodies from the exchange! I hope you enjoy everything. Thanks for sharing it with us at C&C with J&J. I truly enjoyed getting to see what you received ! This exchange has been so much fun and blessing ! Hope you have a blessed week! What a wonderful tea package you received! I love the teacup, so perfect for spring! Enjoy! Hi Kitty, you did get a lovely box of goodies. How fun to join these exchanges. Such joy for us all. Kitty, It was so great to see what exchange brought to you. I enjoyed seeing the thoughtful basket of goodies. Have a great day! Sylvia D.
Kitty, how fun! I need to get in on the next one! Right now I'm doing a fab tea and teapot giveaway. How nice if you or one of your lovely readers won it! Kitty, France dedicates May 1st (their labor day) to the Lily of the Valley. They always make me smile. Kitty, your gifts are lovely and so special, just like you! Lily-of-the-Valley is May's flower of the month and they do smell so sweet. I love a spicy tea as well. Thank you for sharing all your goodies with us and have a wonderful weekend. So sweet Kitty! I love the lily of the Valley teacup. I noticed that mine are just starting to bloom today. It's always fun to make new friends. I really need to join this exchange next time. Thanks for sharing with SYC. So very beautiful! I love lily of the valley and would love it grew up here in the Yukon, but alas it's too cold. Very sweet heart tea infuser, looks like it's being put to good use. Have a wonderful day! Beautiful tea cup. I think it's nice to exchange this way and meet new people.